Susan Wojcicki, CEO of YouTube, talks with Marketplace host Kai Ryssdal. Remember how Larry Page and Sergey Brin started Google in a garage? That garage belonged to Susan Wojcicki. The Palo Alto native eventually became Google's 16th employee. She ran Google's AdSense program for years and was then tapped to run YouTube, the video-sharing website that Google bought in 2006. 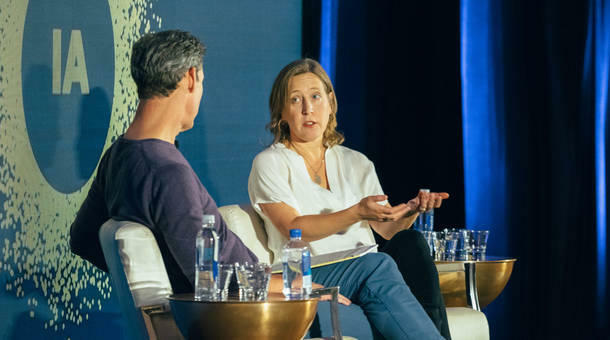 Wojcicki talked to Marketplace host Kai Ryssdal in front of an audience at the Virtuous Circle conference put on by the Internet Association earlier this month. Subscribe to the Corner Office Podcast from Marketplace to listen to the full interview. Wojcicki walked us through how YouTube has changed in the last 11 years, going from a place for random (cat) videos t0 a major content publishing platform. To help illustrate that journey, here are five YouTube videos that explain how YouTube became, well, YouTube. The first YouTube video was uploaded by Jawed Karim, a co-founder of YouTube, in 2005. The next year, the company was purchased by Google. The short video about elephants and their "really, really, really long trunks," started a new wave of video content that changed the way people consumed media. Wojcicki said this 2006 video, of two college students lip syncing to a Backstreet Boys song, was YouTube's first hit: "That was a lightbulb for me that made me realize that video and the technology enabling anyone to create video was going to be really powerful." 4. "Lady Gaga Bad Romance Look"
Tutorial videos are another staple of YouTube these days, and one of the first creators in this genre is Michelle Phan. After joining the YouTube platform in 2006, she gained prominence for her make-up tutorial videos, like the one below from 2010. She has since parlayed that success into multiple channels on YouTube, a beauty product subscription service and a make-up line with L'Oreal. "We have started doing original content, like everybody else," said Wojcicki. YouTube's strategy revolves around their original creators, like PewDiePie, and helping them to create content that might be different from what they usually do. This evolved into the ad-free subscription service YouTube Red, which launched last year.